'no file exists' whereas the right click feature did work. I see the need of a better example, because you have not understood how it works...... 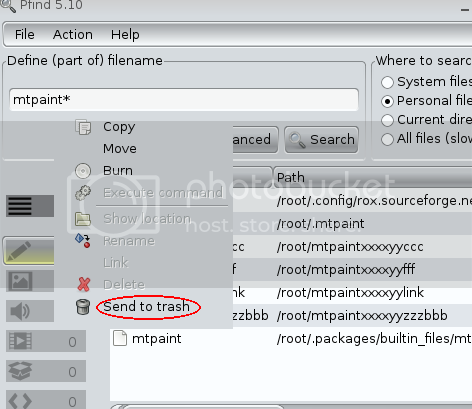 There is no option to filter what files to act on in the execute function. It will act on EVERY file in the list (or the files that are selected). 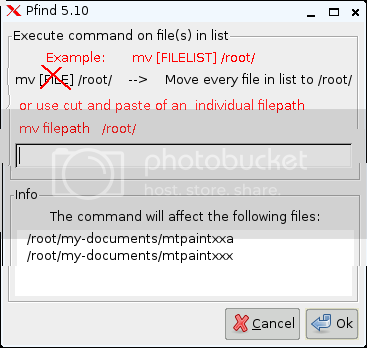 [FILE] should not be replaced by any other word/expression, but has to be included in then execute command as '[FILE]'. will remove every (selected) file in search-result-list. Checked in 5.10, and it all seems fine. You should post pfind 5.10 if you want me to test it this weekend. I use this to create my sfs. obviously this make creating sfs more easy. btw did this program properly copy "link" ? or does it copy the "linked files" ? Thank you for the sfs-building advice. The copying does not follow symbolic links. - Links are links. If you want to copy the actual file, you should use the 'execute command' fucntion instead. cp -H [FILE] /destination/path should give you the file rather than the link. because the PWD was /root. It wouldn't work if the demonstration file was located anywhere else. I have a couple of suggestions and a couple of small bugs. First of all, here is my suggestion for the window to execute a command. and a reminder that cut and paste is possible as well. My second suggestion is to get rid of a feature. to delete all the files simultaneouly. makes right clicking on an individual file difficult and confusing. correctly, but the filename remains the old name. but the hitlist has become blank. I will try to make sfs using your program.